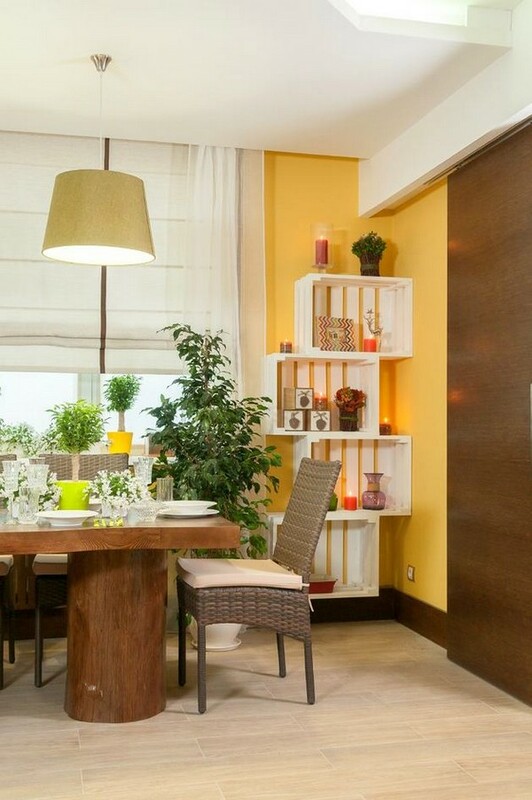 Many countries may boast having TV-shows that make common people’s dreams about perfect interior designs come true. 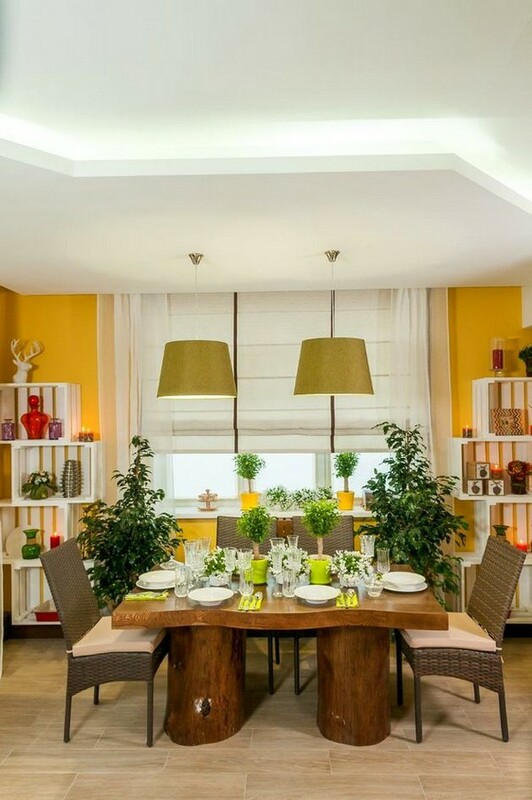 This post will tell you a story of such an interior, created by a famous TV-channel for a family loving summer, warmth, the sun and greenery most of all. They let a professional designer team decorate their living room. Let’s take a closer look at the result! Considering the masters’ wishes in regard of their future interior, the designer team decided to set the summer mood by means of natural finishing materials: marble, moss, wood, wicker furniture and indoor plants. At the early stage some sun was let in to the room by painting a few walls saturated mustard yellow. Out of a tubular section welded was a decorative framework for the future electric fireplace. It was shaped like a traditional stove, painted brown and coated with flexible sandstone. 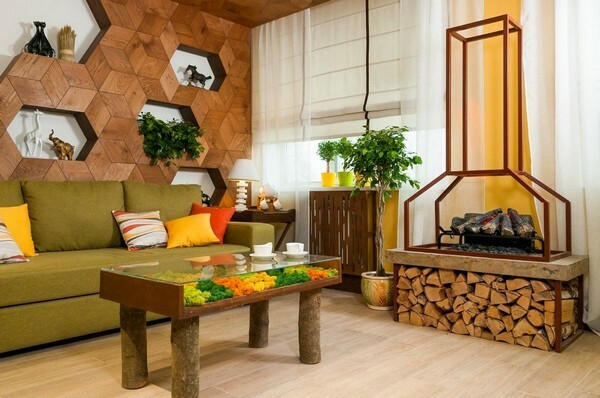 The framework was mounted on a stone base and dressed up with faux firewood that conceals a water tank. Ultrasound membranes cause water evaporation and LED backlights illuminate the steam, creating real fire effect. 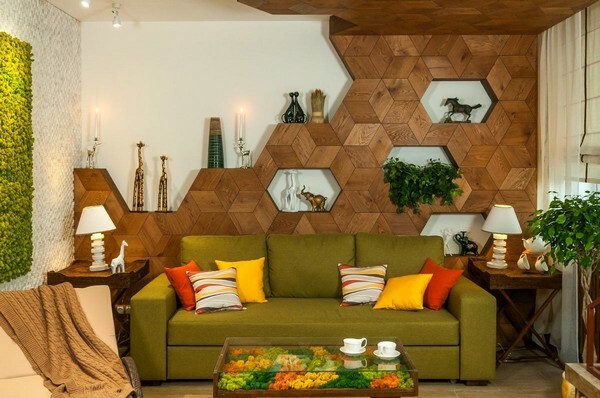 One of the walls was turned into a true designer piece: it was tiled with small three-dimensional natural marble mosaics that look like sugar cubes at the first glance. 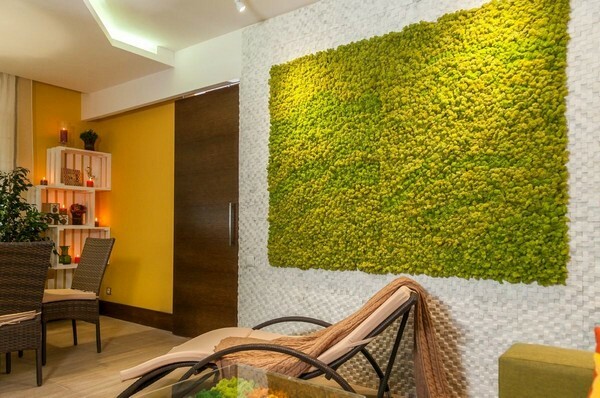 This has created a gorgeous background for a living wall composed of stabilized moss. This is natural moss deprived of moisture using special technology and filled with glycerin-based solution that helps it preserve naturalistic color and texture. 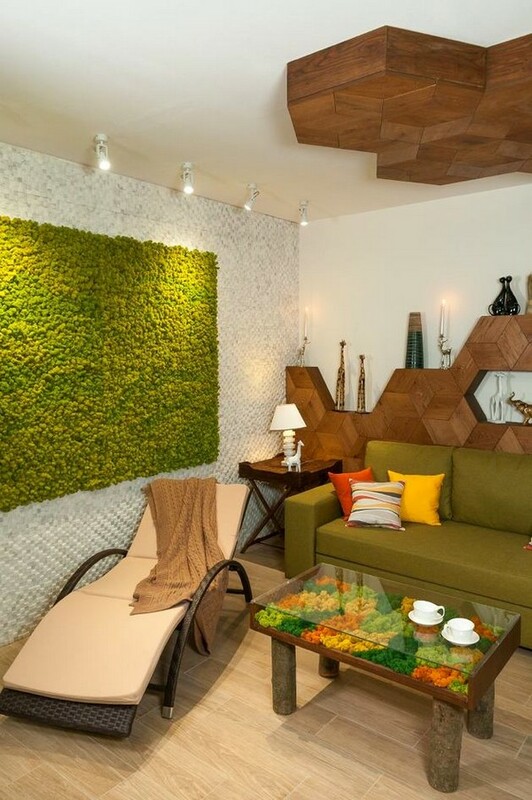 The vertical garden was coupled with a custom-made coffee table featuring moss of several colors. Its legs are made of alder whittlings, the frame – out of a plain edge-glued panel and the top is cut out of tempered glass. To match the fireplace, it was painted brown. One more decorative element intended to match the fireplace is the Roman blinds. They were especially dressed up with brown stripes for this sake. Above them the windows are covered with light curtains made of dense linen of similar color. 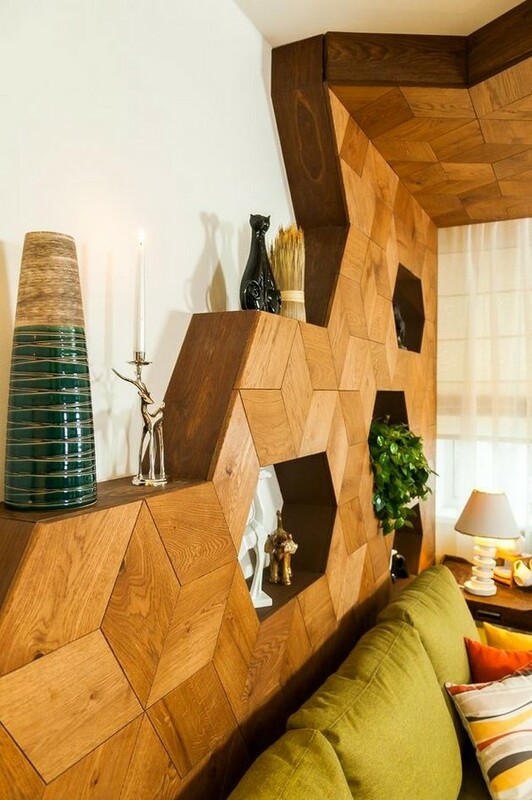 Another original wall décor piece is made of 3D diamond-shaped wooden panels. 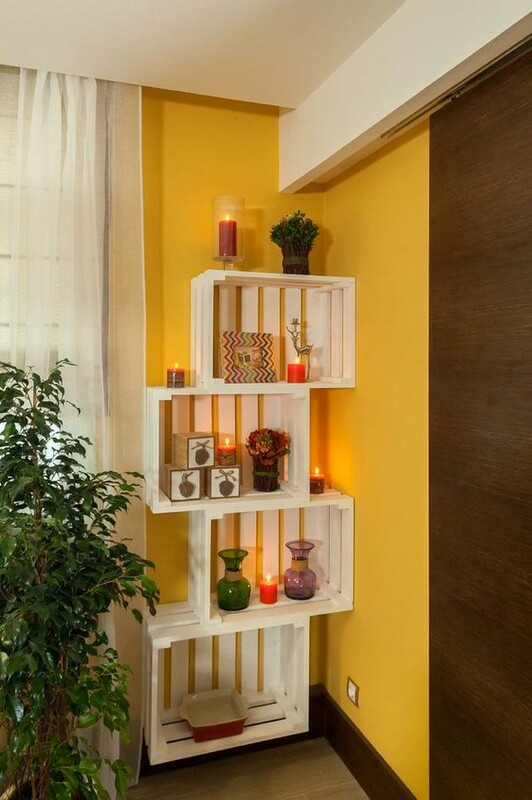 They are mounted to a beforehand prepared metal framework that was then glued over with waterproof parquet plywood and finished with oak slats of bright walnut hue. This zone is additionally dressed up with decorative animal figurines, candlesticks and potted flowers. 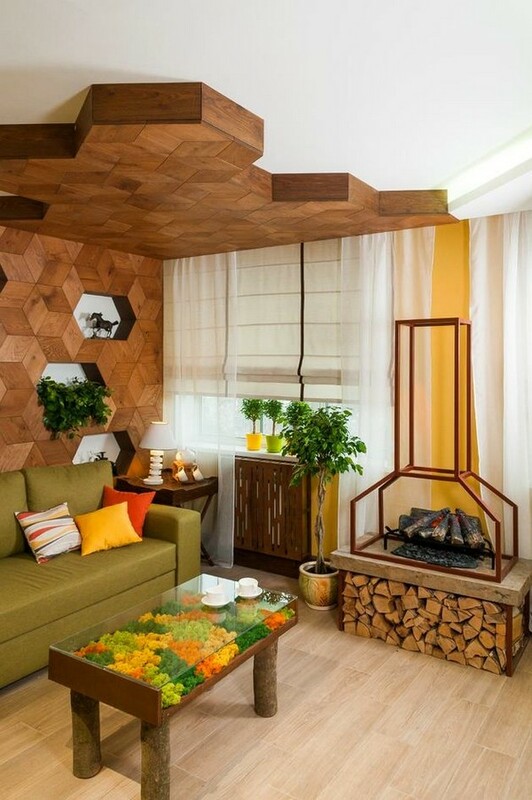 All of these small details were selected with the general style concept in mind – they are either colored in naturalistic hues or made of natural materials. 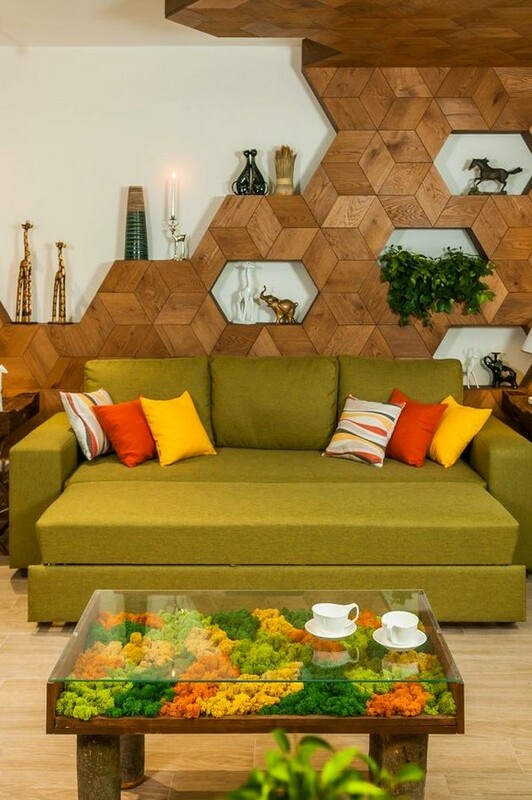 Arranged by this wall is a folding upholstered sofa of warm olive color. 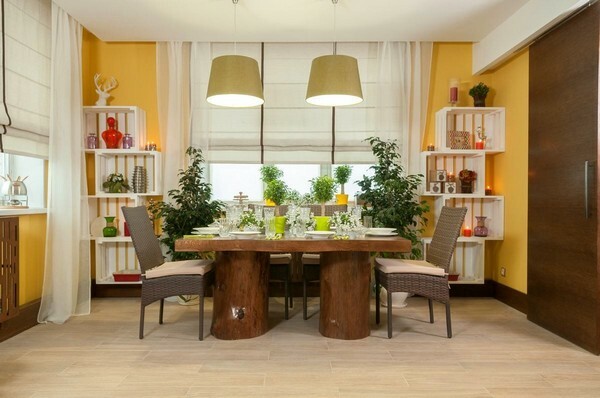 It’s framed by small folding coffee tables with wooden bases and wicker rattan tops. 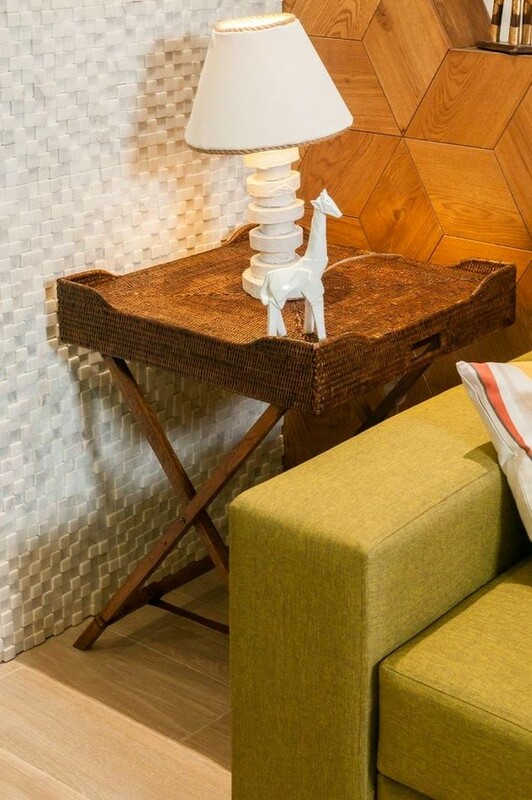 A finishing naturalistic touch of the zone is lamps made of snow-white painted alder whittlings. 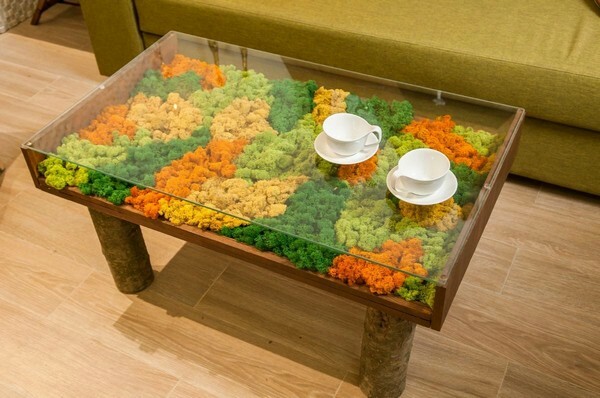 The same material was used to make a bespoke massive table top for the dining zone that was mounted on common tree stumps. The table is accompanied by comfortable faux rattan wicker chairs with aluminum frameworks. In warm weather they can be safely used outdoors. By the way, a chaise lounge located near the sofa is also faux rattan. This zone is lit by traditional ceiling lamps, the shades of which were custom-made from the sofa upholstery fabric. And a white-painted open shelving system framing the dining area is made of common wooden planks. A sliding door was custom-made from a thin MDF sheet and fitted with natural oak veneer.